I tried a non sourdough, faster dough. This dough would have been more flavorful if I was patient enough to leave it in the fridge for 2 days to mature, but I needed dough this afternoon. My all-time favorite pizza was at Regular John’s in West Los Angeles, the place that Barbara and Wade Killefer made fabulous. It had a perfect thin crust, perfect amount of a strong and thick tomato sauce, measured lots of cheese and baked to perfection in commercial ovens. My sourdough dough doesn’t make a good pizza crust. It’s too tough and I’ve tried it lots of times in varying ways. I want a thin crust that is both crispy and chewy and not a bit raw when the top indicates it’s time to pull the pizza out of the oven. 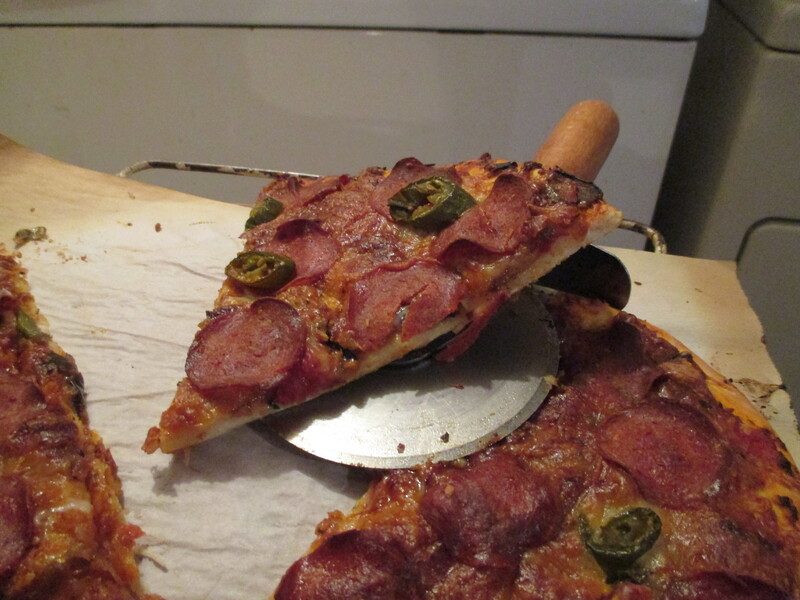 So I found a recipe for a New York style pizza crust, which is the thin kind and some directions on how to do it. The recipe was in grams and ounces and required weighing even the salt on my kitchen scale. (In the end I measured those weighed things in my regular cups and teaspoons and converted it for ease next time.) I only made enough dough for one pizza by the new process, which is dough-to-table in two hours providing all the ingredients are ready and both an oven and baking stone or heavy sheet are at 500 degrees. Way hot, but I don’t mind the heat coming around the corner into the living area. When the dough was raised, I pushed it out on parchment paper with my fingers, thin, a bit more on the edge. Then, I cut one of the leftover Eggplant Parm (blog post to come soon) servings into four pieces, put them on the pizza in quarters, smashed it out all around so there was some everywhere I wanted “sauce” even a bit here and there on the outer crust. Then the rest of the mozz and Italian blend cheeses from Friday, some turkey pepperoni and some drained jalapeno slices. 10 minutes in the oven. FASTER VERSION FOR INEXPERIENCED COOK: Boboli bread, smeared with leftover Eggplant Parm. Added whatever, baked a bit at 350, not 500. ​That’s just slices sprayed with olive oil, shakes of salt and pepper. Bake at 400 degrees for 30 minutes, turning halfway through, til soft and golden. 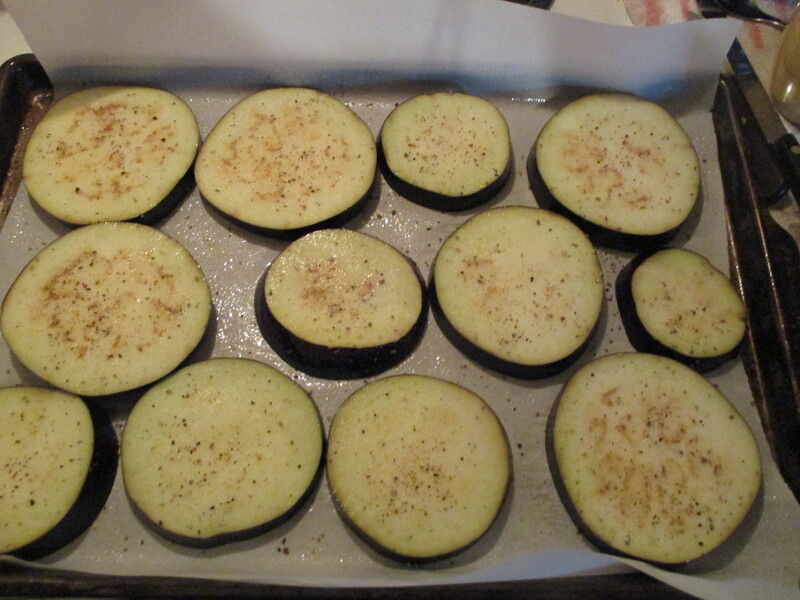 Remainder of my Eggplant Parm recipe coming in upcoming post. 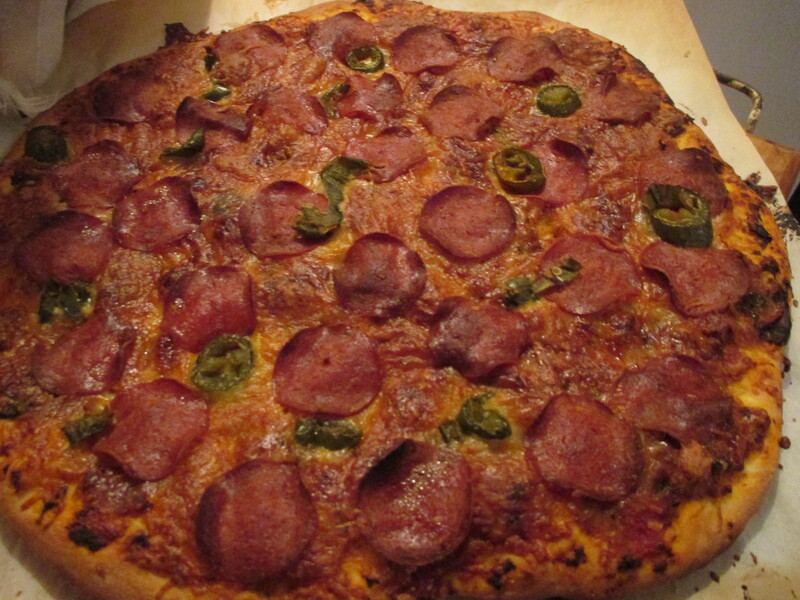 BTW, it is extremely yummy and the crust couldn’t be better unless it was baked in a commercial pizza oven. I doubt that it will freeze well because it had only 1/2 teaspoon olive oil in the dough. Afterthought: see how thin the dough is? That’s why it’s done all the way through.